Seb Reynolds’ side have been in control of top spot for almost all of the National Two South campaign and a 26th win of the season this weekend would guarantee them automatic promotion to the third tier. 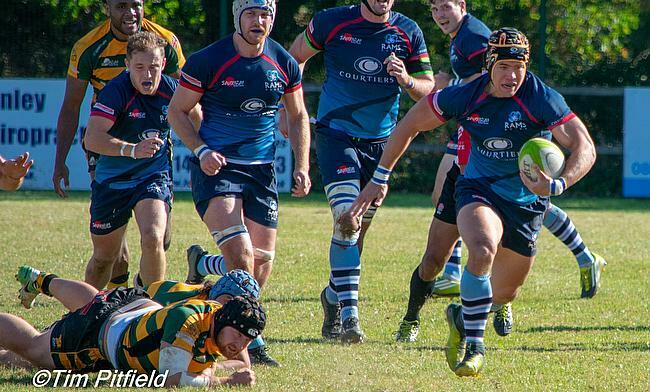 Just below Rams, the battle for the play-off spot continues as second-placed Canterbury host Bury St Edmunds while Tonbridge Juddians (3rd) visit Redruth and Henley Hawks, who sit in fourth position, entertain Guernsey. Sticking with Guernsey, the Raiders are still fighting for survival in National Two South but they could be relegated this weekend if results don’t go in their favour. Fellow bottom three occupants Birmingham and Solihull are also mounting a great escape and the Bees will be keen to continue their remarkable revival against Barnes on Saturday. In terms of the teams who are dicing with danger just above the drop zone, Dings Crusaders take on Taunton Titans in Round 28 while Worthing Raiders and Old Redcliffians collide in a crucial game at Roundstone Lane. Elsewhere in National Two South, Old Albanian visit already relegated London Irish Wild Geese. The first promotion across the National Leagues can be confirmed this weekend when Rams RFC visit Clifton in Round 28. The National Two South leaders know a victory in Bristol on Saturday would clinch the league title and Seb Reynolds’ side will fully deserve their place in National One if they are to secure their spot on Saturday. The Berkshire club were outstanding in Round 27 as they produced an excellent display against Redruth to record their 25th win of the campaign, but out to spoil their party will be Clifton. Matt Salter’s side are also having a very pleasing season as the Lavender and Blacks moved up to sixth place following their battling win over Barnes last time out. The men from Station Road are now three points clear of their nearest challengers Redruth and with three games to go, they are in the driving seat to secure their highest finish for five years. Can Clifton upset the odds and delay Rams’ coronation? It looked as though it would be a straightforward afternoon for Canterbury after a strong end to the first half against Old Albanian last week, but the City Men were made to dig deep in the second 40 as they eventually came away from Hertfordshire with a win. Andy Pratt’s side had to battle for their latest victory in Round 27 and it leaves Canterbury six points clear of their nearest rivals as they close in on the play-off spot. The Kent outfit could secure second place if they pick up a bonus-point victory over Bury St Edmunds this weekend and other results go their way, but their visitors will have other ideas. The Wolfpack will be itching for a reaction to begin April after March seemed to just fizzle out for Nick Wakley’s side. Three successive defeats have dented their top six hopes, but four new signings this week for Bury suggest their focus is very much on the 2019/20 season. Nevertheless, the Suffolk side will want to generate some momentum at the end of this current term as they look to build into next year. Another weekend and another victory for Tonbridge Juddians, but it was far from comfortable for Peter Dankert’s side in Round 27 against Worthing Raiders. The men from the Slade had to work extremely hard for their 10th successive win and TJs’ remarkable run continued as we enter the final month of the campaign. The Kent-based outfit are still in the conversation for the play-off as they sit just six points behind Canterbury, but they must maintain their winning habit if they have any chance of overhauling the City Men in the last three games of the campaign. Next up for TJs is a trip to Cornwall and they face a Redruth side who lost to league leaders Rams RFC last time out. Nigel Hambly’s men begun March with consecutive victories, but concluded the month with back to back defeats which has just halted their top six aspirations. The Reds have lost just one of their last five home matches since Hambly returned to the Recreation Ground at the start of the year and he and his Redruth side will be hoping their decent form on their own patch can continue as they look to become only the second team to inflict a defeat on Tonbridge Juddians in 19 matches. Following their narrow defeat against promotion rivals Canterbury in Round 26, Henley Hawks responded in style last week as they thrashed London Irish Wild Geese 52-0 at Dry Leas. Nigel Dudding’s side showed no mercy and they remain in fourth place and six points behind the play-off spot as we enter the final three matches of a thrilling National Two South campaign. The Hawks are still in the promotion hunt while their opponents, Guernsey, are still battling the drop. Jordan Reynolds’ side have produced a remarkable run of recent form to keep their hopes of avoiding relegation alive and three successive wins means they are now nine points from safety as we begin April. Granted, the odds are still very much against the Raiders and they could be relegated if results go against them this weekend, but with confidence behind them, the Channel Island side are refusing to roll over. Taunton Titans will be keen to end the season on a high after a torrid run of form in March. Tony Yapp’s side enter Round 28 on the back of three straight defeats and after competing for a top two finish for the majority of this term, Taunton’s campaign is in danger of just petering out. The manner in which they lost against Old Redcliffians last weekend would have also frustrated the Titans so they will be determined to produce a reaction when they host another Bristol club on Saturday. Dings Crusaders are the visitors to the Commsplus Stadium and after seemingly distancing themselves from a relegation battle, Luke Arscott’s side now find themselves on the cusp of the bottom three. Dings have won just two of their last nine games and the men from Shaftesbury Park are now just four points clear of the drop zone. The Crusaders will be nervously looking over their shoulder, but a victory against Taunton on Saturday would certainly help ease any nerves. Old Albanian would have taken positives in defeat against Canterbury last weekend. After a disappointing end to the first period, James Buckland’s men were able to show what they were capable of but a lack of cutting edge hampered their chances of defeating the second-placed side. Now the OAs, who have had a very difficult return to National Two South, will be focused on finishing the term on the front foot and next up is a visit to London Irish Wild Geese. The hosts had their fate sealed in Round 27 as a humbling loss at Henley Hawks confirmed their relegation from this division. Eddie Fraher’s side have been competing in the fourth tier for the last three seasons, but the curtain has come down on their time in National Two South. However, they will be keen to end their stay on high and Hazelwood is where we have seen the best of the Wild Geese this term. Despite their loss to Clifton last weekend, Barnes’ run of form over the last month as all but confirmed their safety in National Two South for another campaign. Three wins from their last five games has been crucial because the teams below them have also found their form during the final few matches of this season. Barnes know victory over Birmingham and Solihull would rubber-stamp their place at this level for the 2019/20 season, but that won’t be simple. One of those aforementioned sides going through a positive sequence of results are the hosts on Saturday and Birmingham & Solihull are threatening one of the greatest escapes this division has ever seen. Just two defeats from their last seven games means the Bees are now only four points from safety and considering they had a five-point deduction at the beginning of the term, it would really be remarkable if the Midlands club could avoid the drop. They have also not lost on home turf in 2019 and a bonus-point victory on Saturday could be enough to see Birmingham and Solihull move out of the relegation places. On a weekend where their rivals all seemed to deliver, Old Redcliffians managed to do the same. As Birmingham and Solihull’s resurgence continued, Saul Nelson’s side produced a brilliant second-half turnaround against Taunton Titans to secure an excellent victory at Scotland Lane. The win for the Bristol-based club leaves them 10th in the table and five points clear of the bottom three as they head into a crucial clash with Worthing Raiders this weekend. While Old Reds kept a gap between themselves and the drop zone, the Raiders’ worrying slide continued. Jody Levett’s men were beaten by Tonbridge Juddians last week and it is now 10 games without a win for Worthing. There were certainly positives in defeat against TJs, but the main concern for the Sussex club is the fact that they are now just five points clear of the drop with three games to go. For both Worthing and Old Reds, this is a pivotal fixture and the victor on Saturday will take a huge step towards another year of National Two South rugby.